C. Calvert “Cal” Knudsen was a timber products executive who found his love of wine when he first visited Burgundy. In 1971 he and his wife, Julia Lee, purchased a 200+acre former walnut orchard in the Dundee Hills thinking it had the potential for growing grapes. At that time no one was sure which grapes would grow best in Oregon. Planting the vineyard commenced and by 1975 thirty acres were planted. The vineyard eventually grew to over 130 acres, when most vineyards in the Willamette Valley were less than 5-acres in size. For many years the vineyard was the largest premium grape vineyard in Oregon. The vineyard is primarily planted to Pinot Noir, Chardonnay, and Pinot Meunier grapes. In the 1970’s Cal Knudsen helped establish the Knudsen Erath Winery, and in the 1980’s helped establish Argyle Winery in Dundee. Today most of the grapes from the Knudsen Vineyard are contracted to Argyle Winery for their production of sparkling wines, Pinot Noir and Chardonnay wines. Cal Knudsen was an integral part of the Oregon wine industry, and passed away in 2009. 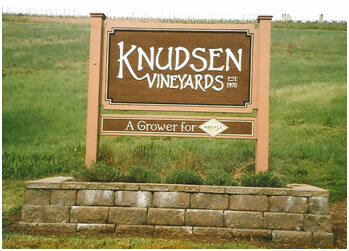 The Knudsen family continues to carry on operating the Knudsen Vineyard.